Barely two weeks after the South East Governors’ Forum (SEGF) unveiled an analytical report on the performance of 2017 budget with a shocking revelation showing that the region was the most marginalized, Chief Charles Ahize, has averred that the Nigerian state has treated and continues to treat the Igbo unfairly. Ahize, a lawyer and the leader of Obigbo, an Igbo socio-political/cultural group from Ihioma Community, Orlu Local Government Area of Imo State in an interview noted that the current administration has no valid plan to improve infrastructure in the South East going by the observations of SEGF who sees better and more than the indigenes. In an interview, he decried the sorry state of infrastructure at the Akanu Ibiam International Airport, Enugu, saying “To upgrade the Enugu airport to a truly international airport would cost about N32bn but this government allocated a mere N2billion to the project in the 2018 budget meaning that it may take 16 years to achieve that”. It would be recalled that SEGF had recently observed that the federal government still has a lot to do in lifting the airport to the original status considering delays in the completion of upgrade construction activities at the international airport. However, the Director of Media and Communication at SEGF Secretariat, Mike Uda said during a briefing in Enugu that “It’s not an accident that SEGF is collaborating with I-Tour Africa. Aviation is a national thing, but for us in the South East, it’s a historical monument. It’s symbolic and dear to us in the sense that we don’t have many monuments in the region”. This is coming few days after the federal government promised to begin total rehabilitation of the infrastructure. Uda averred that “We are glad that the Federal Government is up and doing with respect to the entreaties of South East governors on the airport. “We hope that government will this time around do something about the issues raised by the South East governors recently,” he stated. 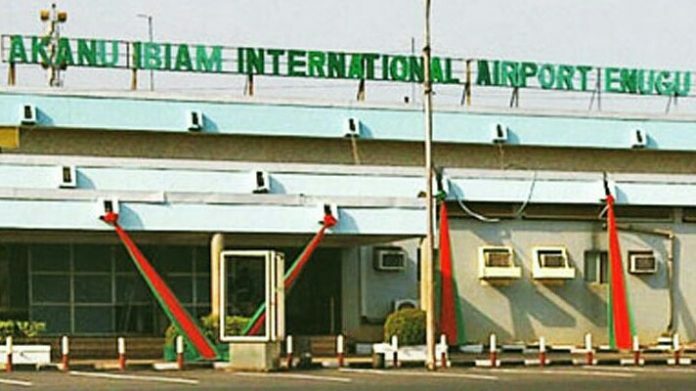 Continuing, Ahize recalled that apart from the state of Enugu Airport, “The Owerri airport has more traffic than all the eight international airports located in the north, yet the federal government finds it difficult to upgrade it to a full-fledged international cargo airport”. “The inland port in Onitsha has been abandoned. The Oguta lake dredging project is dead. No one is talking about any inland port in the South-east, yet we are a people who invest heavily in commerce. “The fate of the average trader in Aba is that he imports goods from Asia and travels 600 kilometres to Lagos to clear it when the goods can easily be sent to Onitsha. At the end of the day the entire nation suffers,” Obigbo president decried. Continuing, Ahize recalled that “The government has borrowed nearly N13 trillion, including overdraft from CBN, in the last three years but cannot find money to fund its N70bn share of the Second Niger Bridge. “To travel from Aba to Port Harcourt, a journey of less than 20 minutes now takes more than five hours if it rains. Since 1999, Julius Berger has only worked on one project in South- East, a section of the Onitsha–Owerri road awarded by the President Olusegun Obasanjo administration. “Apart from the Onitsha-Owerri road, the Okigwe-Afikpo road and the Enugu-Abakaliki road, no other major road project has been completed by the federal government in the South-east since 1999. Commenting on the recent federal government’s response to SEGF’s report where it came up with a list of 69 on-going projects in the region, Ahize averred that “Unfortunately, when you look at the list, you will see projects like the ‘Rehabilitation of Umuahia-Bende-Ohafia Road’ which was awarded in 2005”. “It means 13 years after the contract was awarded, it is still an ongoing project. That is a stretch of road that can be rehabilitated in one year. “The government also published as an ongoing project the Umana-Akwa Road Rehabilitation project awarded in 2006, imagine that the Igbo should be happy about that? “A look at that list published by the federal government shows that since this government came to power it has awarded road construction/rehabilitation contracts of less than N70bn in the entire South-East. “The Delta/Anambra Second Niger Bridge project was awarded by another regime at a total cost of N214billion with the federal government providing just N70billion counterpart funding. “The bridge would be tolled unlike other much more expensive projects across the length and breadth of Nigeria yet there is little or no work going on there. According to him, “I feel ashamed for some of our brothers who because of selfish interest drive the narrative that this government is investing heavily in infrastructure in the South-east when the Mambila Power Project is a N1.79trillion Project and the Bonny-Boddo Road is N120billion project. I don’t even want to talk about the rail projects.